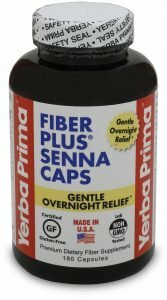 BENEFITS: Fiber Plus® is Yerba Prima’s most powerful formula to restore and promote regularity. It contains all the benefits of fiber, plus the additional colon cleansing benefits of senna, in a base of purifying herbs to soothe the digestive system. Fiber Plus provides a quick, thorough cleansing of the colon when needed. Our combination of senna, fiber and purifying herbs is unique. This Yerba Prima combination gives benefits that cannot be found in normal senna products or fiber products alone. Yerba Prima uses a premium standardized extract of Senna for consistent, reliable results. Senna extract is a potent herb that promotes reliable, gentle bowel activity overnight. Fiber Plus balances the action of senna with the mild bulking fiber benefits of our complete fiber formula containing all 5 fiber types, and with ginger. Our complete regularity formula helps to retrain the bowel for normal, healthy bowel functioning over the long term. The fiber also absorbs and removes toxins and waste material as it passes through the colon. Fiber Plus purifying herbs provide additional balance and cleansing support. Ginger root soothes the digestive system to minimize discomfort, and also promotes proper digestion. Dandelion and Red clover help support the cleansing function of Fiber Plus for maximum benefits. SUGGESTED USE: ADULTS AND CHILDREN OVER 12: 5 capsules, 1 to 3 times a day, with food. For children 6-12: Do not take capsules. Fiber Plus in powder form is recommended for ease of use. Start by taking 1 serving each day. Gradually increase to 3 servings per day if needed. Swallow one capsule at a time. Take each serving with at least 8 ounces (a full glass) of water or other liquid. Drinking additional liquid is helpful. If loose stools, minor gas or bloating occurs, reduce the amount you take until your system adjusts. Use as needed, but not longer than two months everyday. For long term regularity, gradually substitute Yerba Prima Daily Fiber® or Colon Care in place of Fiber Plus. As with all bulking fiber supplements, do not take within 1 to 2 hours of prescription medications. If you are taking medication or are under a doctor’s care, consult a health professional before use. QUALITY ASSURANCE: Yerba Prima’s products are made only from premium quality ingredients. This product has no added sugar, artificial flavor, artificial color, binders or fillers. NOTICE: This product contains senna. Read and follow directions carefully. Do not use if you have or develop diarrhea, loose stools, or abdominal pain. Consult your physician if you have frequent diarrhea. If you are pregnant, nursing, taking medication, or have a medical condition, consult your physician before using this product. CAUTION: Do not take capsules if you have difficulty in swallowing. A very small percentage of individuals, particularly health care providers who have been occupationally exposed to psyllium dust, may develop a sensitivity to psyllium. This sensitivity may result in an allergic reaction. If you experience a strong reaction, with difficulty in swallowing or breathing after taking this product, seek immediate medical attention. Keep out of the reach of children. Ingredients: Psyllium seed husks, ginger root, acacia gum, senna extract 10% sennosides, soy fiber (non-GMO), oat bran, apple fiber, red clover tops extract 4:1, dandelion root & leaf extract 4:1, cellulose, USP Kosher gelatin capsule. Note: The carbohydrate in this product is primarily non-digestible fiber; digestible carbohydrate is less than 1 gram per serving.